This movie, directed by Boon Joon Ho, is about the survivor of people who manage to get on this train after the earth becomes an eternal ground of ice. The earth has been frozen for 17 years and the only place for survivors is to become a passenger on this train. The train never stops; it virtually circles around the same track every year. There are two classes of people: One is the people who manage to get on the train with the clothes on the backs. They are escorted to the tail of the train where the train it lack windows, adequate food and lodging. The second class of people are those that are wealthy, who paid their expensive tickets in advance, are escorted to the front of the train where they live lavishly in beautiful décor; where the food and water supply are plentiful, and their needs are met immediately. As years go by the train embarks on the 17th years of continual survivor. Things do not get any better for the people living in the tail end of the freight train but worse. They are threatened, beaten, mistreated, neglected from adequate food, water and health care; and the parents who managed to have small children find themselves hiding their kids from the leader’s guards who will stop at nothing to exert their powers and used them at their convenience. 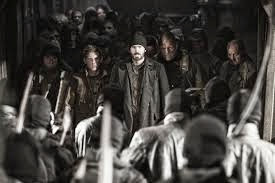 As the movie unfolds, Curtis (played by Chris Evans) is a young, but an angry young man who get fed up with his living arrangements and the treatment of the people, with the help of the spiritual leader Gilliam (played by John Hurts) begin his quest to make it to the front of the train. He gets help from the people who start on this uneventful journey to make it to the engine room. Each time Curtis and his followers enter a new section of the train they embark upon a new but more outlandish section of the cart than the one before. As Curtis and his followers get closer to the front the danger increases and they begin to see the inequalities in living arrangements that define their current global reality. Chris Evans is known for his heroic characters (Fantastic Four, Captain America and Avengers) in the movies he previously played. In this film, although he is not trying to be a hero, he does act as the leader leading the passengers to a better situation in their bad living arrangement. In previous stories his characters always survived the ordeals. In this movie his character does not survive. He does not try to out fight anyone or out muscle anyone. Korean actors Song Kang-ho and Ko Ah-sung, who played Namgoong Minsu as the father and Yona as his daughter who helps Curtis on this journey to make it to the front of the train. Their characters were well executed in the parts they played. There were also well known actors/actresses such as Octavia Spencer who played Tanya, Ed Harris who played Wilford, the train’s owner, Jamie Bell as Edgar, Ewan Bremner as Andrew and Tilda Swinton who character was known as Mason. Snowpiercer was well written and demonstrated a bold idea that caught the audience off-guard where suspense, humor and humanity were well represented in how changes in the environment can define a variety of global reality. I highly recommend this movie.